"Efficiently functioning electricity and gas markets are of vital importance to Lithuania's energy security and its economic well-being. The creation of these markets will help us prevent monopolists from dictating unreasonably high prices," she said in a press release. Grybauskaitė thanked the European Commission for launching a probe in the Russian gas giant Gazprom's monopolistic dominance. The president said that the EU's support is very important to Lithuania in unbundling its gas production, supply, and transmission assets in line with the third energy package. The state will take over the ownership of transmission pipelines, thus preventing Gazprom from obstructing access for other suppliers. The president said that Lithuania's aspiration toward energy independence has become an interest of the entire EU. At the European Commission's initiative, it is proposed to provide considerable funding for new electricity and gas interconnection projects in the EU's next financial perspective period. Grybauskaitė and Oettinger also discussed the progress in the Visaginas nuclear power plant project and its significance for the region's development. Back in the summer, the European Commission gave a favorable opinion on Lithuania's initiative to increase electricity generation capacities by building a new nuclear power facility, according to the press release. EU Energy Commissioner Guenther Oettinger said that the three Baltic states should engage in closer cooperation in the energy sector, where the countries have still failed to agree on construction of a regional gas terminal. "The Eastern Baltic energy markets are relatively small. Consequently, infrastructure development, like new gas supply routes, only makes sense if they serve the whole region," the commissioner said at a regional conference in the Lithuanian capital on Friday. "Open and honest cooperation along with avoiding unilateral actions – with a national focus – is, in my view, the only way to achieve our common objectives throughout the whole Baltic region, and the common response needs to be swift," Oettinger said. He emphasized that "more than ever there is a need for cooperation, and compromise" in crisis. The Baltic states have still failed to agree on construction of a regional liquefied natural gas terminal, therefore, experts of the European Commission were invited to the search for the best location. Latvia's government, which seeks that the regional terminal is built in Riga, has criticized Lithuania's decision to build a terminal of its own at the Klaipėda port without waiting for the EC conclusion. Currently fully dependent on gas supplied by Russian gas concern Gazprom, Lithuania also hopes to build a gas link to Poland and is looking into the possibility of extracting shale gas. 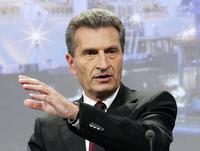 Oettinger also saidthat prices for natural gas imported from Russia should be the same in all EU markets. "In the mid-term, to integrate our markets means to have the same price development in all EU markets. That is a must for me. It can't be that in some member states gas is up to 30 percent cheaper than in other member states," he said during a regional conference in Vilnius when asked what steps the EU should take in response to Russian President Vladimir Putin's recent decree. The decree requires that Russia's strategic companies seek permission from a Russian government body to negotiate on prices and to provide information of significance to national security. It follows the launch of the European Commission's probe into whether Gazprom is abusing its dominant market position in Central and Eastern European gas markets, in breach of EU antitrust rules. Alexei Miller, one of Gazprom's top executives, said on Tuesday that the decree would prevent Lithuanian, Polish, and German energy companies from negotiating any price discounts with the Russian gas giant.